Cognitive behaviour therapy is a brief, non-medical approach that can be helpful for a range of health problems, including anxiety and stress, depressed mood, hot flushes and night sweats, sleep problems and fatigue. CBT helps people to develop practical ways of managing problems and provides new coping skills and useful strategies. For this reason, it can be a helpful approach to try because the skills can be applied to different problems, and can improve wellbeing in general. Anxiety and stress are common reactions to everyday life. The menopause is not necessarily a stressful time but it occurs during midlife when you may be dealing with other life challenges, such as parents’ ill-health or bereavement, adolescent children, children leaving home (or not leaving home), or work demands. Having hot flushes and night sweats can also be stressful, and being anxious and stressed can make hot flushes more difficult to deal with. Stress usually happens when we are in a situation that seems too demanding or overwhelming and we think that we don’t have the personal resources to deal it – we start to think that we can’t cope, which then adds to the stress. When we feel stressed or under threat, the body releases adrenaline to quickly send blood and oxygen to the muscles so that they are prepared for action. Our breathing becomes faster in order to take in more oxygen, and muscles tense to help the body fight or run. This response is not very adaptive in modern life, when most of our stresses are not life-threatening, such as being late or pressure at work. If you have many demands in your daily life, this stress response can be constantly activated. While this is not dangerous over time it can build up and affect health and wellbeing. Similarly, anxiety is a normal reaction to threatening situations, but it becomes problematic when benign and non-dangerous situations and events are regularly perceived as threats, which is more likely to happen if you feel stressed. So reducing anxiety and stress is a helpful strategy to improve wellbeing and to reduce their impact of menopausal symptoms on your daily life. CBT for anxiety and stress focuses on the links between physical symptoms, thoughts, feelings and behaviour. The way we think about symptoms in certain situations tends to affect how we feel and what we do, and these reactions can in turn increase intensity of bodily reactions. Anxious thinking, such as expecting the worst possible outcomes, has been identified as an important factor that triggers and maintains anxiety. Anxious thinking tends to ‘catastrophize’, or overestimate the likelihood of the worst-case scenario happening, and underestimate our ability to cope, leading to an increase in feelings of anxiety. For example, people who are anxious in social situations might assume that others will have negative thoughts about them (e.g. judge them negatively) leading to social anxiety and avoidance of social situations. With panic attacks, people tend to interpret anxiety symptoms, such as rapid breathing and increased heart rate, as being signs that they might have a heart attack or faint. In turn, this pattern of thinking actually leads to an increased anxiety response leading to feelings of panic. Other people might misinterpret normal physical sensations as signs of serious disease and become overly worried about their health. During the menopause palpitations can also occur quite normally with hot flushes. Keeping a diary can help to clarify if they are associated with hot flushes or stressful situations. Cognitive and behavioural strategies can be used to develop a calmer or accepting view of a situation and therefore to respond (behave) in a helpful way. If you feel anxious or stressed write down your thoughts, feelings and behavioural reactions on the diagram. Once you have identified a typical anxious thought, consider whether it is overly negative, overestimating the threat or underestimating you ability to cope. Remember – anxious/stressful thoughts are not facts but are just one view of a situation. Ask yourself: Is there really a threat? What would a calm person think in this situation? What would you say to a close friend if they were in this situation? Have I managed similar situations before? Check your behavioural responses to anxiety and stress and if you are over-working, eating/drinking too much, or avoiding certain people or activities, then consider more helpful alternatives. Think about what you do that makes you feel calm or content, however small those things might be (e.g. relaxing, yoga, going for a walk, exercise, calling a friend, reading a book). Try to do more of these activities even for just a short time every day. Aim for a balance between rest and activity, and by pacing activities throughout the day. Low Mood should not be expected during the menopause, and many women are relieved not to have periods. But it can occur at this time for a variety of reasons. For example, hot flushes and night sweats can be tiring and affect sleep; self-esteem can be affected by overly negative beliefs about menopause, and overly negative expectations about aging; and busy lifestyles and demands often accumulate during mid-life. Some women report premenstrual type symptoms, which may be associated with fluctuating hormones. Most of these factors are time limited and after the menopause in general women tend to report increased wellbeing compared to when they were in their 40s. CBT for low mood is helpful for people across the age range and when physical and emotional symptoms occur together. As for anxiety, low mood and hot flushes often occur together and the cognitive and behavioural strategies are helpful for both emotional and physical symptoms. When people are depressed, they tend to think more negatively about themselves, the world in general and have negative expectations about the future. Depressive thinking and behaviour can lead to a cycle of self-criticism and hopelessness, and many people often withdraw and avoid situations and feeling worse as a result. This can happen to people who would normally think quite differently, when they are not depressed. CBT can help people to identify overly negative thoughts, so that they can gain a perspective on their concerns and gradually learn how to manage these thoughts. Cognitive and behavioural strategies can help people to make changes so that they begin to increase activity and be less self-critical. The first step is to look at life from a broad perspective – the things that you value (about yourself and life in general), what you used to enjoy doing, and/or how you would like things to be in 5 years time. Then you could gradually reengage in activities that you previously valued and enjoyed but which you might have dropped or withdrawn from since feeling low. Making these changes in behaviour by engaging in pleasant activities and developing a structure to the day can help to initially lift mood. As with anxiety and stress – remember that depressive thoughts are not facts but are just one view of a situation. Ask yourself: Is this view of myself really accurate? What would a close friend/family member say to me? What would a self-supportive alternative be? For example, instead of ‘I’m not good enough’, ask yourself who is saying this and what is the evidence – we are usually harder on ourselves that we need be. Talking to other people can help to gain a helpful perspective. Small changes such as gradually doing things that you have enjoyed, or new things, and writing down three things that went well at the end of each day (however small) can lift mood and improve wellbeing. An important part of CBT is to encourage people to value their own qualities, strengths and competencies. If problems are persistent, e.g. financial, health, housing etc, then ‘problem-solve’ considering all options with someone else, and seek practical help and advice. Hot flushes and night sweats are the main changes experienced by women during the menopause transition – the time when menstrual periods stop. Flushes can be accompanied by sweating, and palpitations or sometimes shivering, and can cause embarrassment, anxiety, discomfort and sleep disruption. What causes them? Hot flushes occur when oestrogen levels are changing and adjusting to a lower level during the menopause transition. They tend to be more frequent when oestrogen reduces rapidly, e.g. following surgical menopause or some treatments for breast cancer. Hormone levels affect our body temperature control mechanisms – it is as if a thermostat has a narrower range of temperature changes it can tolerate, so that our bodies try to ‘cool down’ by having a hot flush in response to small changes in our bodies and in our surroundings that previously would have gone unnoticed. The threshold for flushing also narrows if we are under stress so reducing stress and relaxation is an important part of managing hot flushes. Relaxation and paced breathing can be used to calm down your body’s physical and emotional reactions. Paced breathing is slow, even breathing from your stomach. The diaphragm is located just below the lungs and forms a barrier between the lungs and the stomach. Breathing from the stomach or below the diaphragm increases lung capacity, so that we get more oxygen, and it also has a significant calming effect. If practiced regularly, paced or diaphragmatic breathing can help you to relax. You can practice by keeping the chest and shoulders still and pushing the stomach out as you breathe in, and taking slow, deeper breaths. Putting one hand on your chest and one hand on your stomach helps as you get used to this way of breathing. The hand on your chest should stay fairly still and the hand on your stomach should rise and fall as you breathe. It might be easier to practise this lying down at first. Once you get used to it you will be able to use this breathing for a few minutes during the day to reduce stress and to feel calm. Let your shoulders relax and focus on your breathing for a few minutes can give you time to pause and to think how you want to react in a stressful situation. What can help to cool down? Wear light layers so it is easy to remove layers if you have a hot flush. Try wearing loose fitting clothes made of natural, light fabrics such as cotton. Cotton sheets, with a lower thread count, will also help you to remain cool at night. Remove any heavy, thick down duvets from your bed; placing a towel in your bed can absorb some of the sweat, preventing your sheets from becoming drenched. Some women also use a Chillow Pillow, which remains cool throughout the night. Hot flushes can be triggered by stimulants, such as coffee, hot drinks and some spicy foods, alcohol, stress, by changes in temperature, or activities, e.g. rushing to work. If you keep a diary of hot flushes and note down was happening just before the flush you might be able to identify your hot flush triggers, and then by making small practical changes you can gain some control over them. CBT for hot flushes focuses on the links between physical symptoms, thoughts, feelings and behaviour. The way we think about symptoms in certain situations tends to affect the emotions we feel and what we do, and these reactions can in turn increase intensity of the hot flushes. For example, in the diagram, when this woman feels the onset of a hot flush, she thinks that everyone is looking at her and that she can’t cope; this leads to feelings of embarrassment, loss of control and anxiety. These feelings might then lead to increased tension, palpitations and sweating, which intensify the hot flush experience. CBT can help you to find ways to reduce these negative reactions to hot flushes. Learning calmer more neutral responses will help you to feel more in control and more able to cope. Paced breathing is an important part of the CBT approach for hot flushes. As with any skill it requires regular practice – breathing from your stomach. At the onset of a flush – relax your shoulders – breathe slowly from your stomach – concentrate on your breathing. Paced breathing involves focusing on your breathing, accepting that the hot flush will pass and just letting the hot flush flow over you. “Everyone’s looking at me” – “I look terrible”. “I’ll never get back to sleep”, “I’ll feel terrible tomorrow”. Women with the highest levels of distress in reaction to hot flushes tend to ‘catastrophise’ about the hot flush, i.e. think the worst. They are more self-critical within the situation, especially about their appearance. Notice what goes through your mind when you have a hot flush, so that you can identify your typical thoughts and any overly negative thinking, and write them down. Is this though really accurate? What would a close friend/family member say to me? What would I say to them if they were having a hot flush in this situation? What would a self-supportive alternative be? Using paced breathing at the onset of a flush can give you a moment to pause, and help to switch your attention to breathing rather than the flush and to think of neutral and calming thoughts. Generally it is better to stay in a situation and not leave, or avoid activities, if you can, as avoiding social and other situations means that you won’t learn that you can manage, and that you might stop doing things that you might enjoy. It is also helpful to challenge negative social images and negative attitudes about menopausal women, that are still often held and that can reduce our self-esteem. Women do not age dramatically at the menopause – but it helps to take time to help yourself through the process. Look around you – the average 50 year old can be healthy, and active, with many social roles. Many women are ashamed to mention the menopause – so try talking to your friends and family and help reduce the stigma around the menopause. 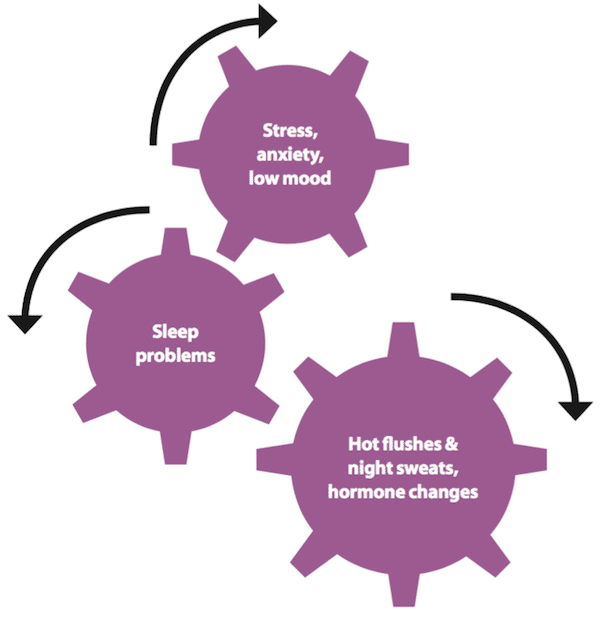 applying the cognitive behavioural work for hot flushes to develop calmer thinking and behavioural responses when sleep is disrupted due to night sweats. Limiting light in the early evening and in the bedroom helps the brain to release chemicals (melatonin) linked to sleep onset. This includes light emitted from mobile phones and laptops so switch these off. Limiting caffeine and alcohol, both of which have a negative impact on sleep onset and quality. A cool sleeping environment helps facilitate sleep as the body naturally cools as we sleep. This is particularly important when you are having night sweats. Develop a good bedtime wind-down routine that you practise each night to help you relax prior to going to bed which makes sleep more likely. Maintain a regular sleep pattern – ‘lie-ins’ and naps after 3 p.m. eat into sleep the following night which means you could have difficulty dropping off. It is best to avoid naps all together is possible, but if you really need one, make sure its before 3pm. Even after a poor night sleep, research consistently shows that it is better to continue as planned the next day and not cancel activities and plans, as this can set up unhelpful thinking and behaviour that makes sleep problems worse. CBT for night sweats and sleep As with hot flushes, take time to notice and manage worrying thoughts – about stress and loss of sleep. Ideally, set aside time during the day to address unhelpful thinking patterns or to manage problems or stress that may keep you awake at night. As part of a wind down routine, practising relaxation and paced breathing can reduce overall stress and provide a balance to busy lives. Paced breathing, when used regularly throughout the day, is then easier to apply at night to induce relaxation when required. Even if you make some of the changes described above and improve sleep quality, it is likely that you will still be woken by night sweats. As with hot flushes during the day, the key to managing night sweats is to use cognitive behavioural strategies to remain calm. Feeling anxious about missed sleep makes it more difficult to get back to sleep. With consistent practice, this should become easier and more effective. Calmly and automatically get up and do what you need to cool down. Watch your thoughts while doing this – try not to engage with them, and return the focus of your attention to your breathing. Once you have cooled off, get back into bed and practise paced breathing and relaxation. Practising paced breathing and making some adjustments to your reactions to hot flushes might be all you need to feel a bit more in control. But if you are interested in finding out more about CBT for hot flushes and night sweats, or following a more detailed programme, then this is available in a self-help guide over four weeks that has been shown to be effective in clinical trials.